Strontian is the main village in Sunart in Lochaber. It lies near the head of Loch Sunart. The name ‘Sunart’ translates from Gaelic as ‘the point of the fairy hill’, meaning a low, round hill inhabited by the sidhe, mythological fairy-like creatures from Scottish mythology. Nearby Ariundle, a National Nature Reserve since 1977, is a part of the ancient Sunart Oakwood and is situated between the village of Strontian and the former lead mine sites of the area. Foresters Lodge is a unique, luxury self-catering lodge in one of the most spectacular and unspoilt remote areas on the west coast of Scotland, with sauna and jacuzzi bath. 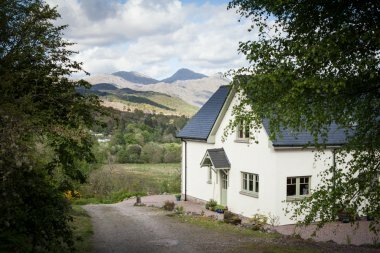 Ideally located to explore the Ardnamurchan peninsula, Guest book first page of Foresters Lodge website!